In October Brazilians will vote for president in particularly troubled election. It is the first ballot after Dilma Rousseff’s controversy impeachment, which put into power the unpopular interim Michel Temer. Besides, Lula, the first candidate in the polls, is in prison and was barred from running the election. Finally, it is the first time that a radical populist candidate has gained notable support in the Brazil. Jair Bolsonaro is second in the polls and his success is anchored in his opposition to traditional political elites, specifically Lula and the Workers’ Party. This candidate is former military, known for his authoritarian approach, conservative position, and anti-minority agenda. So what has led to Bolsonaro’s rise? This can be explained by socio-economic and circumstantial factors in the main. First, the Brazilian GDP decrease of 3.5% in 2015 and 2016 and the consequent loss of 2.6 million formal jobs between those years caused disenchantment with the political elites, especially with the Workers’ Party that governed the country from 2003 to 2016. Second, corruption scandals gained unprecedented importance and increased the distrust of politicians. The ‘Car Wash operation’, an ongoing money laundering and bribery investigation by the Federal Police, has reached 13 political parties, and 55 members of congress are now under investigation. Social transformations that have occurred in Brazil in the last two decades are also determinant to explain this new type of populist leadership. In the early 2000s, Brazil experienced a period of inclusive growth with reduction of poverty. Also, economic expansion and the increase of the minimum wage led to the formation of a new middle class. This group, called ‘the strugglers’, accounts for more than half of the Brazilian population and distinguishes itself from the full-fledged middle class in terms of its social and economic security, consumption patterns and lifestyle. Their relatively insecure position has been aggravated by economic crisis and the low level of public goods and services directed to this stratum. They feel abandoned by the State and believe that social policies benefit “lazy people” and criminals instead of “hard workers”. Bolsonaro speaks directly to this cohort’s resentment. He explores the idea that the country is out of order, suffering from a crisis of values in society and politics. Like many other populist politicians, Bolsonaro is far from being an outsider. He has been a deputy for 27 years and was a member of one of the most investigated parties within the Car Wash operation. Nevertheless, he claims to be incorruptible and able to put a new form of politics into practice. 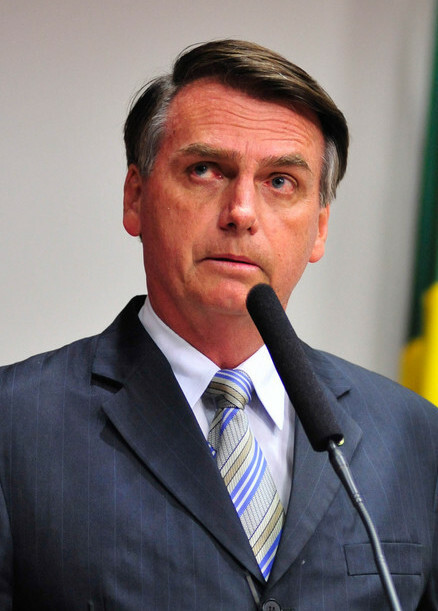 More significantly, Jair Bolsonaro marks a depature from the pattern of populist leaders in the continent, and shows similarities with Western European populism. Populism in Latin American has been termed ‘inclusionary’, as opposed to its Western European ‘exclusionary’ counterpart. That is to say that Latin American populist leaders support the social inclusion not only of the poor, but also of the culturally excluded, as well as the increase of voiceless people’s political participation. Additionally, the social construction “us vs. them”, the very foundation of the populist discourse, is usually painted in broader strokes, and “them” is normally an external threat. Conversely, most populist parties that have been emerging in Western Europe since the 1980s are radical and right-wing – i.e. they are nativist (a combination of nationalism with xenophobia) and authoritarian. Therefore, the exclusion of ethnic minorities from the welfare state and politics is inherent to these parties’ ideologies – making them exclusionary. These differences in the populist parties’ emphasis are anchored in each continent’s socio-economic specificities. Poverty and inequality are features of Latin American societies; therefore, distributive conflict is at the core of the political dispute in this region. Western European societies have achieved a relatively higher standard of living, and cultural rather than materialistic issues have gained political relevance. Because Bolsonaro does not fit into the model of inclusionary Brazilian populist leaders, such as Getúlio Vargas, scholars and journalists hesitate to define him as a populist. Also, the misuse of the concept “populism” has led to its association with charismatic politicians, or the political practice of granting social benefits to please voters. Nevertheless, if we turn to Cas Mudde’s definition, Bolsonaro can be indubitably characterised as a populist. Basically, the author defines populism as an ideology that separates society into two groups, ‘the pure people’ and ‘the corrupt elite’, and contends that politics should be an expression of the people’s will. Bolsonaro clearly makes this division. He attacks political elites for being responsible for the country’s crisis. The Workers’ Party is particularly blamed for the current political and economic situation. He also sustains that all parties are similar, and all politicians are self-interested and corrupt, using the same vicious practices to govern. Additionally, he claims that he will govern for the Brazilians, the “respected citizens”, under the pretence of a unified population, denying the existence of class, racial, and gender conflicts. Besides populist, Bolsonaro’s discourse is also radical. His authoritarian character is explicit. The candidate claims that human rights discourse is a leftist banner to protect criminals, disregarding the population’s safety. He proposes, for example, the reduction of the age of criminal responsibility and the liberalisation of gun control. He also shows no intention of including the underprivileged. In fact, poverty and social exclusion are often criminalised in his discourse – for example, he associates homeless people with drug addicts. His prime focus is to exclude minority groups from social protection, as he claims that those groups are unduly privileged by the State. Moreover, he advocates against racial quotas in public universities, speaks against the law that criminalises homophobia, and denies the necessity of State intervention to reduce salary disparity between men and women. As alarming as Bolsonaro’s current success is, what has been significant about his rise is the inability of mainstream politicians and the media to deal with his popularity. The candidate has received television space to talk about his controversial themes and the prospective presidential candidate has not been confronted enough about his proposals regarding economic and social issues. Therefore, the chance of a drastic change in the polls in one month is slim and, as a result, we should expect a populist radical right-wing politician at the runoff of the Brazilian election this year. © Juliana Chueri. Views expressed on this website are individual contributors and do not necessarily reflect that of the Centre for Analysis of the Radical Right (CARR). We are pleased to share previously unpublished materials with the community under creative commons license 4.0 (Attribution-NoDerivatives). Kerstenetzky, Uchôa, and Silva, ‘The Elusive New Middle Class in Brazil’, Brazilian Political Science Review 9, no. 3 (2015): 21-41. Mudde and Kaltwasser, “Exclusionary vs. inclusionary populism: Comparing contemporary Europe and Latin America,” Government and Opposition 48, no. 2 (2013): 147-174.